Summary:Everyone knows the unwritten rule: You don't like your best friend's boyfriend. Awesome! I've been looking at this book for awhile on my wishlist. i want the unwritten rule! I have yet to own or read an Elizabeth Scott book and this is one I've really been wanting to read. Count me in. I have been dying to read this! Great review and thanks for the awesome contest. I've heard mixed reviews. Can't wait to see what I think! I'd love to win this, thanks! I've read mixed reviews on this one, but I would love to give it a try. I can't wait to read this! Enter me please! I just discovered Elizabeth and I love her already!! 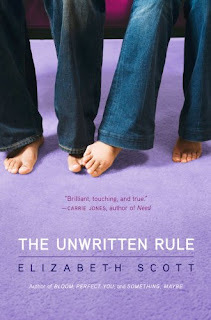 I love Elizabeth Scott, so I am DYING to read this one! I love Elizabeth Scott but haven't had a chance to read this one yet. Would love to win it! I WANT!!! Enter me please!!! I would love to win this-I'm so excited I got my sister interested in Elizabeth Scott and I would love to share this with her too! You have such a great selection of books to win. I have been wanting this one for awhile! I've read and loved SOMETHING MAYBE by Scott, and would love to read this. Thank you! Enter me please! I've heard so much about this book! I haven't read this yet. I would love to win this. This is the only Elizabeth Scott book that I haven't read and I'm so sad! Plus, my friend is thanked in the front! I have been wanting this for a while! I can't wait for school to be out so I can read! I have been wanting to read this one for awhile now. Please enter me for it..
Another one on my wishlist1 Count me in. You scored some awesome books! Here's hoping! I've been meaning to buy this since it came out, but it would be awesome to win it! I've been wanting to read this one for a while now.Enter me please! I seriously want to read this. Sounds like an interesting book, please count me in. Sounds interesting. Please count me in. Oh, I love Elizabeth Scott!! I would love to be entered. Oh. My. Intelligenceness. This book sounds so freakin' amazing. I wonder is Sarah's best friend knows that Sarah likes Ryan. I have to win this, lol! Oh, I love ES! So want this. I have a US mailing address too even though I'm in Canada and I'll be there in May. Please enter me. This is already on my wish list. I really want to read it. I love Elizabeth Scott! Please enter me! I would love to win this, its so awesome. ive ehard great things and would love toread it.